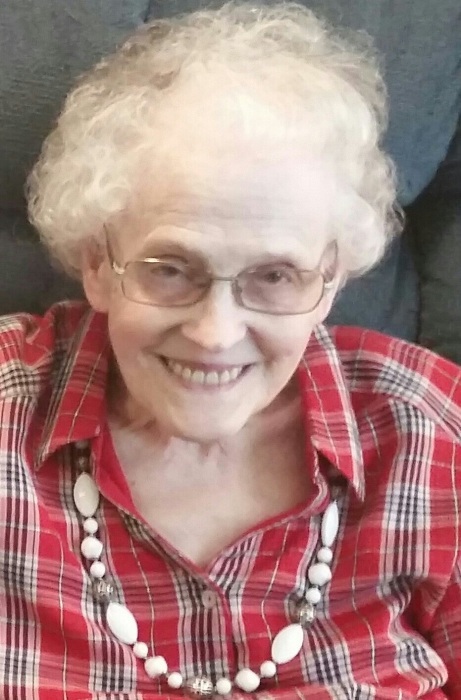 Former Muncie resident, Martha Jean Paschall, age 87, of Bradenton, Florida, passed away at her home on October 13, 2018. .
She was born in Clarksville, Tennessee, on February 14, 1931 to the late Inman and Olie Reding and grew up in Clarksville. She was an identical twin and one of eight children. Martha was a graduate of Clarksville (Tennessee) High School and attended Austin Peay State University. She worked for the telephone company, Woolworth Store and as a seamstress for a local dress shop in Clarksville. She was a former member of Ball State University wives, Muncie First Church of the Nazarene, and Kankakee First Church of the Nazarene. Martha was an active member over the years of Muncie First Church of the Nazarene where she served as a Director of the children’s dept., leader of children’s church, Sunday school teacher, a choir member, and sang in a lady’s quartet. She loved the Lord, her family, church, and friends. Her family loved and adored her. Her family feels so blessed to have spent so many wonderful times together over the years especially during the Holidays. Martha poured so much of her love into her cooking and baking which her family enjoyed. God bestowed on her many gifts, from hospitality, to entertaining, to cooking, crafting, and flower arranging. Martha opened her home to many colleagues, friends, students, family, people from Muncie First Church and people from the community. She especially enjoyed sharing her home’s Christmas cheer during the Holiday’s where she decorated her house outside and every room on the inside. Their home was truly a winter wonderland. Martha loved to play the piano and organ. Her favorite song she could remember to play, and sing was “Silent Night”. She took pleasure in gardening and observing birds at her many different bird feeders, especially the cardinal. She is survived by her husband Homer Donald Paschall of 68 years, one son David (Fran) Paschall of Vandalia, Ohio; daughters Linda (Bruce) Wilson of Bradenton, Florida and Brenda (Tom) Lale of Grand Blanc, Michigan. Seven grandchildren Erica Wilson, Renee Cole, Michelle Paschall, Adam Paschall, Ashlee (Michael) Talaski, Natalie Green, and Allie Lale. Eleven great-grandchildren Damian, Abbi, Carson, Keegan, Brody, Dominik, Halia, Gabriella, Isabella, Breydan, and Preston. One sister Pauline Campbell of Elkton, Ky.
She was preceded in death by her parents Inman and Olie (Brooks) Reding, two brothers James Reding and Inman Irvin Reding, Jr., four sisters Ethel Polikowsky, Kathryn Breshers, Mary Lowry (her twin), JoAnn Killoran, and one son Donald Paul Paschall. A funeral service will take place at 2pm on Saturday, October 20, 2018 at Muncie First Church of the Nazarene, 3101 N. Benton Rd., Muncie, Indiana 47304 with Pastor Mark Dill officiating. Visitation will be from 1:00 until the time of service. Memorial donations may be made to the Paschall Family Life Center at Muncie First Church of the Nazarene. Online condolences may be sent to the family at www.parsonmortuary.com.